Are you posting to the wrong social media platform? Your time is finite, there simply aren’t enough hours in the working day to do everything you potentially could to increase awareness of your digital fundraising campaigns. When organising your social media strategy you will want to be spending your time focusing on the platforms that can lead to high audience engagement and that will have the greatest return from the time you will be investing. We Are Social’s latest social media stats provide a comprehensive look at how the world of social media developed in 2016, and a great insight at the entire digital world should you wish to delve deeper. So how did the individual platforms fare from these big increases? Facebook accounted for much of the share of the increases in 2016, with a year-on-year growth of 24% and an increase in 363 million monthly active users. The extended universe of Facebook, including Facebook Messenger, WhatsApp, and Instagram also demonstrated strong year-on-year growth, with Messenger and WhatsApp sitting just beneath Facebook itself in the monthly active users table. Twitter users number around 317 million as of January 2017, although reports in early February from the social media platform suggest they have since increased to 319 million. This is due in part to the ‘Trump bump’ as the new US President uses the platform regularly to talk about policy and lambast critics. However, Twitter does suffer from large numbers of ‘bots’ or automated accounts, which some have suggested could total hundreds of thousands of fake accounts or more. Snapchat, the photo and video messaging app, is not far behind twitter in user numbers, with an estimated 300 million* monthly active users. Popular with millennials, Snapchat has become a key channel for many brands that are trying to gain visibility for their products or services with a highly-engaged younger audience. So where does this leave you? How can you decide where your social focus should be? You obviously need to be where your audience wants you to be. They will be more willing to engage with what you are saying on the platform that they prefer and spend more time using. So make sure that you are studying your social media analytics and keeping an eye on where your supporters are most engaged, and on what type of content that works the best. Having said that, following social media trends, and how the number of active users worldwide are fluctuating can put you ahead of the game when there is a big shift from one platform to another (Myspace anyone?). It is also worth trying new channels that you may not have had a presence on before to see whether or not they can access a different demographic that may expand your supporter base of people who care. Have you made any changes to your social media planning for 2017 or switched focus from one platform to another entirely? Let us know in the comments or on Twitter. Thanks for the data Matt! This surely comes very handy. 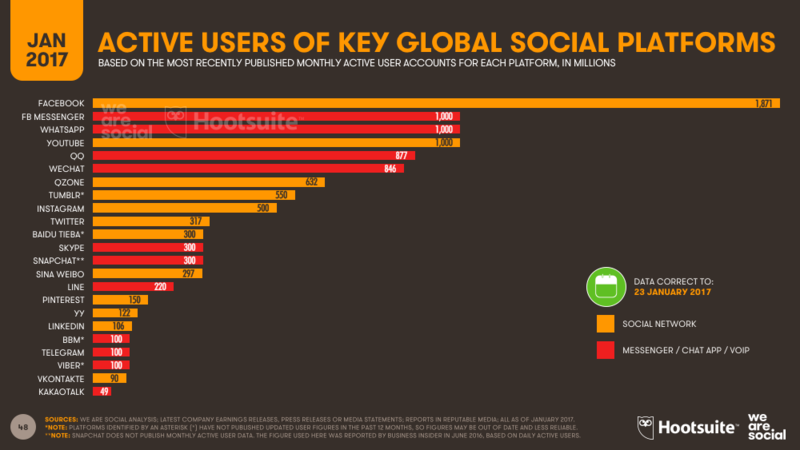 Facebook is no doubt the most popular platform. But I was wondering, does Facebook also rules with regards to stories now?